Learn Chinese and Speak Mandarin 2.7 is other software developed by Learn Chinese. Learn Chinese and Speak Mandarin is a revolutionary and award winning new system for learning Chinese designed by language experts. The program contains personalized lessons that give special attention to everyday language and pronunciation. Users have access to two different speeds of playback for each item. The InstantSpeak method uses a unique audio flash card system that allows you to effortlessly recall what you have learned. 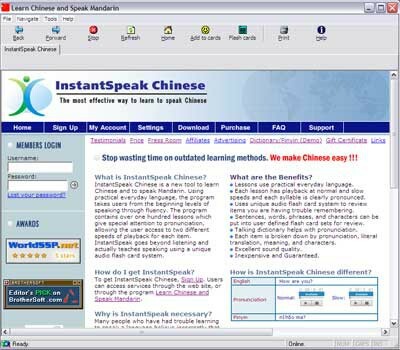 This program is shareware, which means you can download and use Learn Chinese and Speak Mandarin 2.7 for free during 30-days trial period. After this period you gonna have to buy Learn Chinese and Speak Mandarin 2.7 software for $45.99 or uninstall the program. Learn Chinese and Speak Mandarin 2.7 supports different languages (including English). It works with Windows 98/XP/Vista. We have tested Learn Chinese and Speak Mandarin 2.7 for spyware and adware modules. The software is absolutely safe to install. We has completely tested other software Learn Chinese and Speak Mandarin 2.7 many times, written and published the interesting article and uploaded installation file (2025K) to our fast server. Downloading Learn Chinese and Speak Mandarin 2.7 will take minute if you use fast ADSL connection.